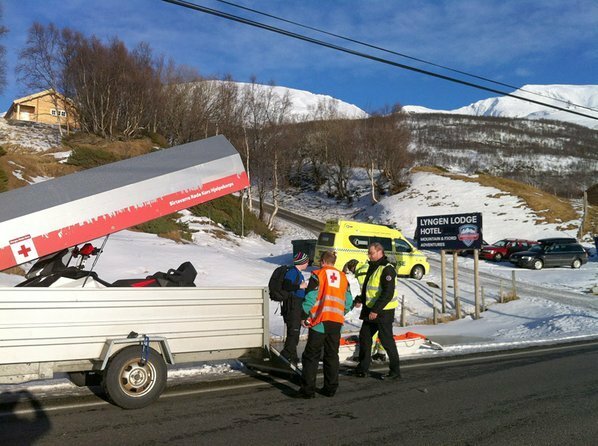 Five foreign tourists have died after being buried by a major avalanche in northern Norway, local police say. The victims are reported to be four Swiss and one French citizen. A sixth man was pulled out and taken to hospital with “moderate injuries”. They were part of a larger group of skiers which apparently split into two groups before the avalanche. Around 30 rescue workers, assisted by dogs and helicopters, were dispatched in the search and rescue operation. The avalanche happened on Mt Sorbmegaisa in the north of Troms district, about 65 km (40 miles) east of Tromso, on Monday afternoon. The identities of the five victims have not been released. The survivor, thought to be Swiss, was taken to a hospital in Tromso. “It’s a man. His injuries are moderate and his condition is stable,” hospital spokesman Jan Fredrik Frantzen, told AFP news agency. Police said rescuers had detected signals from the skiers’ avalanche transceivers buried in the snow. Troms police chief Tor-Einar Eilertsen said a medical helicopter had been despatched and the army had been asked to help. In a later statement the police said around 30 people with sniffer dogs were helping in the rescue. Avalanches are relatively common in Norway at this time of year, as higher spring temperatures start to warm and dislodge blocks of snow.